In Ceremony in Death, Eve is confronted with a few personal dilemmas after the death of a fellow police officer indicates he might have been dirty. While IAD requires the investigation, Eve becomes primary on a secret investigation where she must place Eve the cop before her personal feelings or loyalties. The investigation that takes her into an underworld filled with magic, a Satanic cult and the Wiccan religion. I had a tough time getting through this book and was "stuck" at a certain point for a few months. I finally began re-reading it (again) and finished Ceremony in Death this month. In Ceremony in Death, J.D. Robb explores the Wiccan religion, witchcraft and psychics in a futuristic world and I really enjoyed the way this particular part of the story was crafted and some of the secondary characters introduced - young Jamie, who loses his grandfather and sister to the Satanic cult, was a favorite. The story itself takes quite a few twists and turns. Eve doesn't believe in magic or psychic powers and she is confronted with things she doesn't really want to understand. Roarke becomes her personal guard as she unknowingly places herself and others in danger while discovering the differences between white and black magic. Eve's personal loyalties are also questioned when she's asked to keep Feeney out of the investigation due to secrecy, placing her in an untenable position. This story had a few surprises for me. One of them was Eve's over-the-top treatment of a suspect while she was interviewing him. Sometimes I find that as an investigator, Eve can be purposefully blind when it suits her and the results are not always pretty. 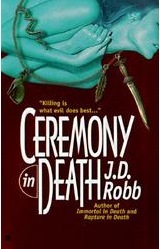 Ceremony in Death ended up being a very good read for me, although not a favorite in the end. Although I enjoyed some of parts of the story, I was frustrated with Eve's lack of "vision" and her inability to consider other people's perspectives. J.D Robb highlighted Eve's weaknesses in this installment as an investigator: Eve's narrow views don't allow her to process facts and ideas clearly. Hopefully there will be further growth for her in future installments. In Vengeance in Death the title is perfect. 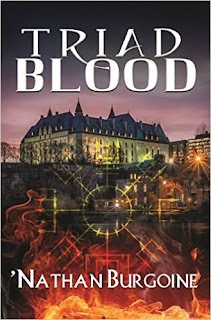 Roarke's past comes roaring back with a vengeance as a killer starts by dismembering and disemboweling a man in a hotel room and calling Eve to solve a puzzle and the murder. Soon, as the bodies begin to pile up, Eve and Roarke come to the realization that all the dead are Roarke's old friends from his murky childhood in Ireland. What becomes quickly clear, as Summerset becomes the main suspect, is that Roarke is meant to be the killer's crowning glory in this game of revenge and murder. One of the most violent and horror-filled books to this point, Vengeance in Death is also the book where Roarke's childhood and part of his past in Ireland is explored. This is a story full of tension and emotions, not only for Eve and Roarke, but also for their butler and Roarke's friend Summerset. In this story, Summerset's character is explored, as well as his relationship with Eve and Roarke. This was an emotional read. There were moments when I didn't know who upset me more, Eve or Summerset -- they are both so stubborn, hardheaded and emotionally stunted, it's still tough to choose. Throughout this story there are times when Eve goes too far in her role as a cop, as does Summerset with his uptight prejudices. Neither gives an inch, no matter how much they hurt each other. At times, it was tough to read and to like or sympathize with either one of them. Instead, my sympathies went to Roarke who is clearly in the middle of two people he loves and who love him. That is not to say that J.D. Robb doesn't balance the scales. She does. Both Eve and Summerset work through tough issues in Vengeance in Death, as does Roarke, and all three make this an exciting read. Great new secondary character introduced in this book? McNab, the new EDD computer geek who has the hots for Officer Peabody. I love the competitiveness between the two and McNab's easy way with both Eve and Roarke. Vengeance in Death is my favorite book in the series so far. I really enjoyed the roller-coaster emotional ride the characters go through, while Eve and her team race to solve the mystery. The suspense in this book kept me involved throughout and the final outcome fits perfectly with the overall story. Eve and Roarke have some highly charged scenes in this book as well and those were not lost on me either. The fact that some light was finally shed into Roarke's past is a definite plus. And last, but not least, I love the way J.D. Robb continues to weave the futuristic aspects of her world into this series seamlessly, including them without overwhelming the story with too many details. Out of the two, I liked Vengeance better too. It was good to read more about Roarke and his past along w/Summerset. You and I had the same impressions (ha!) of Ceremony and Vengeance. Vengeance is still one of my favorites... wait until you read Conspiracy! That one was tops! McNab and Peabody are the best secondary characters I've read in books. Love them. Mariana, I'm glad to see that Conspiracy is not to far down the list. Looooved McNab, can't wait to get to know him better, and well Peabody is already a favorite. Vengeance was good, but it's not a book I re-read often. That's the book where the little boy Kevin is introduced, right? and Roarke goes back to Ireland and meet an old friend? Nath, I really liked Jamie! I loved that scene and his interactions with Eve and Roarke. Soooo I gather he makes appearances in the future? (NO spoilers!!) LOL! And yes, Vengeance is where Kevin is introduced and Roarke goes back to Ireland... great book. I really enjoyed it. Like Mariana said before me, just wait until you get to Conspiracy. You'll love it! That and Judgment has been my favorites so far.